"drumlin." YourDictionary, n.d. Web. 11 April 2019. <https://www.yourdictionary.com/drumlin>. An elongated hill or ridge of glacial drift. An extended, oval hill or ridge of compacted sediment deposited and shaped by a glacier. Drumlins are typically about 30 m (98 ft) high and are longer than they are wide. They have one steep and one gentle slope along their longest axis, which is parallel to the direction of the glacier's movement. 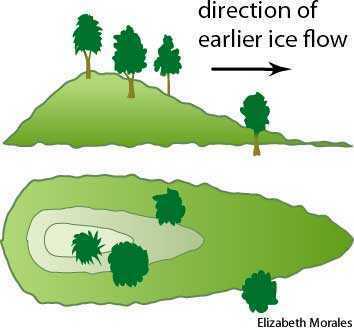 The steepest slope faces the direction from which the glacier originated, and the gentler slope faces the direction in which the glacier was advancing. (geography) An elongated hill or ridge of glacial drift.